Every bride planning a summer wedding hopes for sunshine. Sadly, Mother Nature is just about the one thing that a Bride just cannot control! 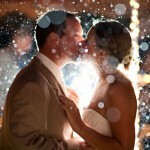 ♥ Remember the most important thing is not the weather – but the fact you are marrying the love of your life! ♥ You are going to get some unique, amazing photos! Have colourful umbrellas and gumboots on hand! ♥ Rain is actually considered lucky – it is seen as a cleansing, start of a new phase, fertility and growth! ♥ Your Rain Day venue may turn out to be even better than your first choice. Friends of mine were planning their ceremony on a hilltop with a spectacular view, however when the gale force winds kicked in the ceremony was moved to the reception venue built over the ocean so the wild crashing waves were really atmospheric. ♥ Your flowers won’t wilt. ♥ You will be able to keep your cool in your big dress!